Termites are thought to have diverged early in insect evolution. Ancestors had gradual metamorphosis and the ability to fold their wings over their backs. Their body plan is simple, while their social behavior is advanced. 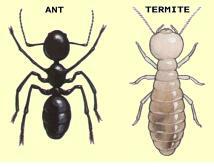 Termites are hemimetabolous, medium sized, polymorphic (having more than one form) social insects. They have biting mouthparts, and antennae comprising 9 to 30 segments. The alate forms (Swarmers) have four almost equal wings and compound eyes; however, the sterile workers and the secondary reproductives have no or greatly reduced compound eyes. Each member of the termite colony (workers, soldiers, and kings & queens) looks different. 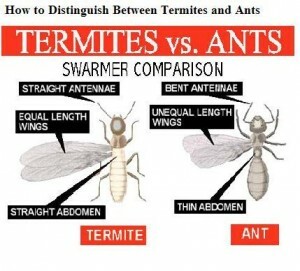 Termite soldiers are slightly bigger than workers and have enlarged and darkened orange head capsules. 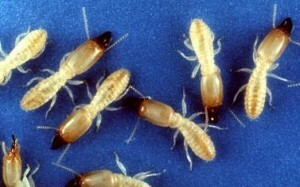 The workers are creamy-white and are approximately 5-6mm in length. As queens reproduce, they become massive creatures of up to 9cm long. The kings are cream colored like the workers, and look like tiny maggots compared to the queen. Ants have 3 body segments and elbowed antennae, while termites have 2 body segments and straight antennae.